Evolve with us. Become a better teacher, person and practitioner of yoga. As an accredited educational institute with the Yoga Alliance since 2009, Sol Yoga offers a wide range of high quality educational programs to improve your life and prepare you to become a professional yoga teacher or wellness professional. NOW ENROLLING. Love yoga? Feel inspired to learn more, take your practice deeper or become a teacher? Our established, foundational program will provide just what you need to expand your experience of yoga, inspire you, and for many, change your life. 8 Weekends May 3-5, May 10-12, May 31-June 2, June 21-23, July 12-14, Aug 23-25, Sept 27-29, Oct 4-6. Additionally, there are 4 sessions on Wednesdays from 630-930pm. The 1st one is May 1, 630-930pm, our opening night. The second one is May 8th, 630-930pm. Others TBD and announced at the beginning of training. Only a few spaces remain. Early bird pricing $2800 until Feb 10th, 2019, $2700 for Sol Yoga Members, payment plans available in 4, 6 or 8 month installments. See application for details. Learn teaching methodology and tools to structure and teach 'gentle' non flow yoga & flow yoga to all levels. Learn Ayurveda, the sister science of yoga. 2019 DATES COMING SOON. This comprehensive training program will simply make you a more sophisticated teacher and practitioner of yoga. Over 8-12 months, our amazing team of experienced local teachers will pair with world class experts to take you deep into the integrated holistic impact of yoga and Ayurveda on the mind, body and spirit. This program builds on our Yoga Alliance approved, established and respected 200 hour foundational program and exceeds the requirements of Yoga Alliance for your RYT 500 status. INCREASED FLEXIBILITY. Our 300 hour program is conveniently split into 2 parts (Part A & B). Part A is offered once per year and students are required to attend 8 weekends (200hrs) to complete this section. To complete Part B, you may dive deeper in to your unique area(s) of interest by selecting from a variety of 100, 50 and 25 hour hour tracks, that suit your interests and schedule. Both Part A & B must be completed to obtain your 300 hour certification. To make your training even more robust and comprehensive, you could complete as many elective 100, 50hr or 25hr ‘tracks’ as you would like. Additional CEU’s available. (200 hours). Students are required to attend 8 weekends + teaching circles and virtual programming to advance their knowledge of the 8 limbs of yoga. Senior Sol teachers plus additional guest teachers will take you deeper into philosophy, asana, pranayama, meditation, anatomy & physiology, Chakras and Ayurveda from an advanced, holistic perspective. Part A - 8 Weekends: Dates available soon. Hours are Fri 630-930, Sat & Sun 8-430pm, plus 1x/month 3 hour 'teaching circles' on Wed or Fri night (dates TBD). Additional virtual program will be included but physical attendance is not required. $3200 for Part A. $3000 if you preregister & pay in FULL be deadline. Payment plans available. If you are having financial difficulty, please let us know - some scholarships and alternative payment plans may be available. Part B cost varies per program. HOW TO REGISTER: To apply for part A, please complete this application and email it to [email protected]. Once accepted, you can secure your place in the training by registering here. (100 hours). You may register separately for this portion of the training. Choose from several current options (tracks) with additional tracks in development. We recommend you complete part B concurrent to part A, or within 1-2 years from of Part A. 100, 50 & 25 hour training's are open to any yoga teacher with 200 hour certification, wellness or medical professionals, educators, social workers or caregivers looking to enhance their professional resume. CEU's available for most courses. Also open to those seeking personal development. More tracks in development including Aerial Yoga and more. Grace Jull illuminates anatomy as a path to our fullest potential. WEEKEND TRAININGS. Our programs work with your busy life. Most of our programs are offered on the weekends so you can retreat to our light filled studios for inquiry, education and inspiration, all with friends. We meet Friday nights from 630-930pm, Sat & Sun 8-430pm. All weekends include a variety of learning methods, physcial locations and amazing teachers, keeping you engaged and supported throughout. Offering some of the industry's most well educated, inspired and respected teachers, facilitators, faculty and trainers, Sol Yoga attracts depth and offers authenticity. Many of these questions have come directly from inquires about our program. Please feel free to email us with other questions (and you might see them added to the list!). How much training do you have to have before starting the program? We require at least 1 year of regular yoga practice (at least 3x per week) for our 200 hour program and 1 year of active teaching for our advanced program. But you may qualify with less, if you have recently fallen in love with yoga and have been practicing VERY frequently, or you are seeking personal development. What is a typical training weekend like? With about 20 hours of training each weekend, they are jam packed and schedule oriented. We vary the learning environment to include lecture, hands on experience, yoga practice, group activities, etc. Sometimes we sit for long periods of time, other weekends we practice a lot, it just depends on the nature of the topic we are covering (meditation vs. Vinyasa yoga!). Most of the time, we snack during training or have a ‘working’ lunch, so you should come prepared for a full 8.5 hr day. How many books were required and are there tests related to reading these books? There are some required books and you will receive the book list prior to your training start. There are informal and formal tests and much of the information does come from the books, but we usually discuss it as well. How much time is required for studying? That is really up to you. The people that get the most out of this program maximize the required books, complete all assignments and make a considerable out of class effort to learn about yoga. For most weekends, there are homework assignments ranging from reading, short papers, class planning, creative projects, etc. There is ample time to complete these assignments between weekends. What do I do with my certification once I have completed the program? Will you work with Sol Yoga? Many people choose to start teaching immediately and for those people, Sol Yoga offers many opportunities including mentoring & hands on assisting programs, good cause yoga (unpaid) teaching gigs as well as opportunities to be on our regular class schedule. Others choose not to teach at all or wait to start teaching, which we also support! Am I fit enough and do I have an advanced enough practice to handle YTT? The perception that teacher training is largely a physical training is a myth. Rather, one of the biggest complaints is that it’s really hard to sit on the floor and pay attention to all the information being presented. There will certainly be periods of intense physical practice and advanced posture clinics, but as always, in any yoga class at Sol Yoga, you must adjust to care for yourself. You will learn to embody this concept so you can teach it to your students. Your physical ability is not an indicator of your readiness and we welcome all levels of ability including individuals with chronic illness, physical limitations, handicap and pregnancy! Yoga is for everyone. Did we have to learn a lot of Sanskrit? Sanskrit names will be offered, and there is a suggested book to help with memorization and pronunciation, but there is not a strong emphasis or requirement that you must master it. I don’t think I could ever stand in front of a class and teach. On the first night of training, you can never imagine the growth you will experience. We don’t throw you into the fire immediately! You slowly begin teaching, with partners, in small groups, and in teams. You create classes on paper and get written feedback and over the course of 8 months, you slowly build your abilities and confidence. And if you don't want to teach at all, you can still join this program for personal development. I LOVE yoga but honestly don't know If I want to teach, therefore I'm not sure if I should spend the money. 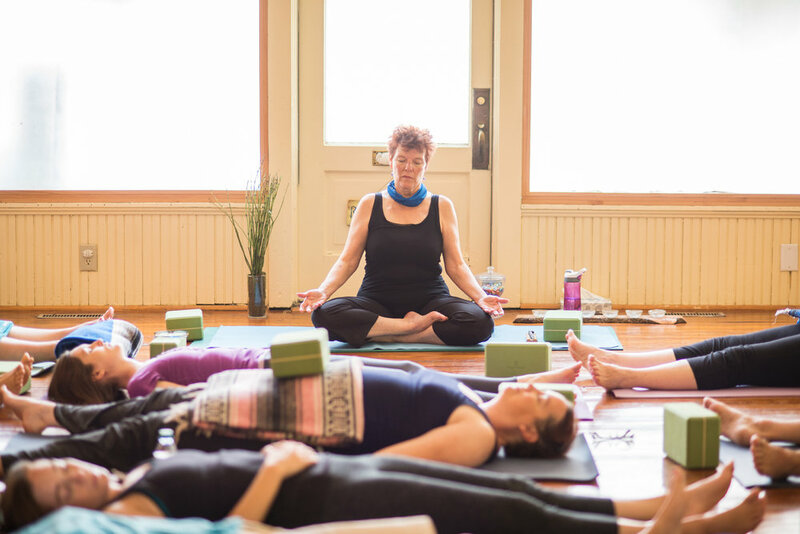 If you read the testimonials of actual participants in the program, you begin to see how the benefits of the program extend well beyond teaching yoga. In fact, the intention of YTT is to benefit your personal practice, which influences your teaching. Many start out doing it for themselves and then realize they are good at teaching and become teachers in the end. And if not, you always have the certification should you change your mind. It’s well worth the investment. Don't you have to be an advanced yoga student to be a good yoga teacher? No. Not in the sense that you can do tricky poses and flashy sequences. If you teach from the heart and care for your students, you have the greatest potential as a teacher. What kind of yoga will I be qualified to teach when I graduate from this program? This program prepares you to teach gentle, non-flow, Hatha yoga as well as Vinyasa Flow Yoga. You will learn to teach yoga to all levels and abilities as well as some specialty groups. Is it a big deal if I miss one of the weekends? Yes, it is. It is difficult to make up weekends as massive amounts of material are covered. Additionally, you lose the continuity of the program, which is crucial to the experience. We have made exceptions for things like weddings and births and in these special cases; there is a makeup policy in place.